During the manufacturing process the Japanese stainless steel blade is heated to over 1832 Degree Fahrenheit (1000 Degree Celsius) in an annealing process and then ice-hardened at -176 Degree Fahrenheit (-80 Degree Celsius). The metal's structure altered by the ice-hardening and annealing also ensures the exceptional hardness and toughness of the metal as well as improved resistance to corrosion. These qualities have a positive effect on the cutting stability of the COLORI Titanium knives. The knives remain sharp for longer. The different titanium coatings also give the blade a classic, elegant look. 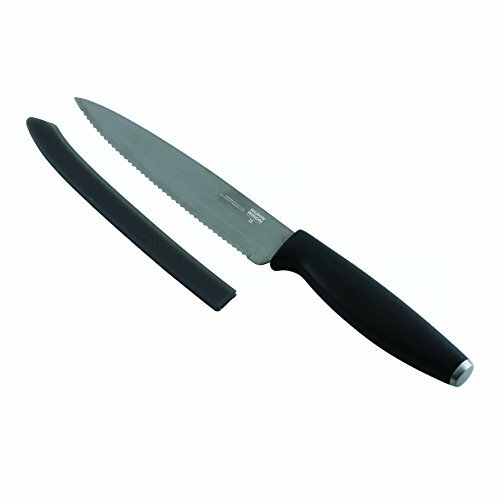 The COLORI Titanium collection are knives that are versatile in use, for dicing, chopping and mincing. The blades have been ground on both sides in an angle of 14 Degree (double bevel) and is outstandingly suited for cutting meat, vegetables, fruit, cheese and much more. The stylish non-slip handle sits comfortably in the hand, even if you are working with it for a long period. The matching blade sheath ensures safe storage and keeps the blade sharp. Though it is safe to wash in the dishwasher we recommend hand washing/drying to keep the blade sharper longer.